The convergence of IBM mainframe capabilities with Internet technology, connectivity, and standards, particularly TCP/IP, is dramatically changing the face of information technology and driving requirements for ever more secure, scalable, and highly available mainframe TCP/IP implementations. The series Communications Server for z/OS TCP/IP Implementation provides easy-to-understand, step-by-step guidance about enabling the most commonly used and important functions of CS for z/OS TCP/IP. 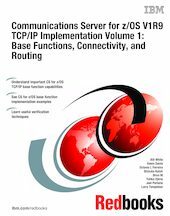 This IBM Redbooks publication, Communications Server for z/OS V1R9 TCP/IP Implementation Volume 1: Base Functions, Connectivity, and Routing, SG24-7532 , introduces CS for z/OS TCP/IP. Then the System Resolver, showing the implementation of global and local settings for single and multi-stack environments, is discussed. Finally, implementation scenarios for TCP/IP Base functions, Connectivity, Routing, Virtual MAC support, and sysplex subplexing are presented.